Rahul Dravid is all set to announce his retirement from test cricket on Friday. It was 1996 and India was touring England. This was the first time I got to see “The Wall” Dravid bat for India. The media coverage those days wasn’t so great for domestic cricket so knowing a player before debut was not that easy. The series did not start well for India as they lost the first test in Edgbaston and as with the case in the 90’s Sachin was the standout performer with a hundred. India decided to go with 2 debutants for the Lord’s test. The 90’s wasn’t a great decade for debutants for India until that point and considering the criticism vented on Ganguly at the start of the tour I wasn’t hoping too much from either Dravid or Ganguly on their debut. How wrong was I? After dismissing England for 344 in the first Innings, India found themselves in early trouble as usual at 59/2. After few partnerships and brilliant innings by the debutant in the match Sourav Ganguly, India were 202/5 still 142 runs behind the English total. Rahul Dravid the other debutant for India walked in to join Sourav in the middle. It was a great moment for Rahul and like Sourav he did not want to let this opportunity slip. 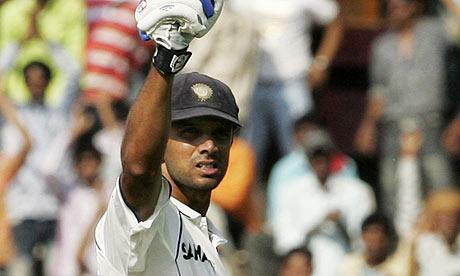 Rahul Dravid even in his first innings at the international level showed great composure and calmness at the wicket. He was a perfect foil for the flamboyant Sourav Ganguly who went on to make a brilliant hundred on debut at Lord’s. Rahul though missed the mark by 5 runs. In spite of him missing his hundred we all then sensed that we had witnessed something special. For the next 15 years along with Sachin, Sourav and Laxman he has been the vital cog in the Indian middle order. Coming in at number three he has been the India’s most important player overseas and has played quite a few memorable match winning knocks. A player par excellence was named the “The Wall” for his amazing appetite for runs and his watertight defense which is almost impossible to breach when he is settled at the crease. He has been a perfect team man often doing what is required of him in the team. He has been pushed around in the batting order even though he has been India’s best number 3 by a distance. He has batted in all positions in the batting order and has also opened when required for his team. He also donned the keeping gloves for a while when India were looking for balance in the ODI squad. Rahul will be always known for his brilliant hundreds in Indian overseas victories over the past decade. Rahul also made India proud with his brilliant speech at the Sir Bradman oration late last year in Australia. He is an articulate speaker and his speech then was like one of his silken cover drives. Dravid will finish with 13288 test runs at an average of 52.31 with 36 hundreds and 63 fifties. He has been India’s best number 3 by a distance scoring 10524 runs at an impressive average of 52.88 with 28 hundreds and 50 fifties. Rahul Dravid was not a bad ODI player either, he remodeled his game to suit the shorter format and became one of the best middle order bats for India in the late 90’s and better part of last decade. In 344 ODI games he has scored 10889 runs at an impressive average of 39.16 with 12 hundreds and 83 fifties. Not bad for a player called as test specialist. Rahul as a captain was brilliant too. During his tenure at the helm India had an amazing run in both forms of the game. Under his leadership India won a test series in West Indies and England after a long time. India was also unbeatable at home during the same time in ODI. It was unfortunate that he decided to give up the test captaincy after the English tour. He was player with great cricketing brain and I am sure he would have been an excellent captain had he continued. Rahul captained India in 25 tests, winning 8 and losing 6 with a W/L record of 1.33. His ODI record is impressive too with a W/L record of 1.27. There is no question that Rahul has been a perfect role model off the pitch too. He is a soft spoken individual who always says the right thing in the media. Rahul has been a great role model and a brilliant player over the years for India and a true legend of the game. He has given us wonderful memories through his batting and the Indian team will for sure miss his presence in the middle order. Looking at the performance of the youngsters on this A tour, it shows how priceless Rahul was for the Indian middle order. We will miss Rahul for sure in the test team. This was the tribute I wrote when he retired and I wish he stayed a little longer.